This is a katzbalger, the chosen side arm of Landsknechts. 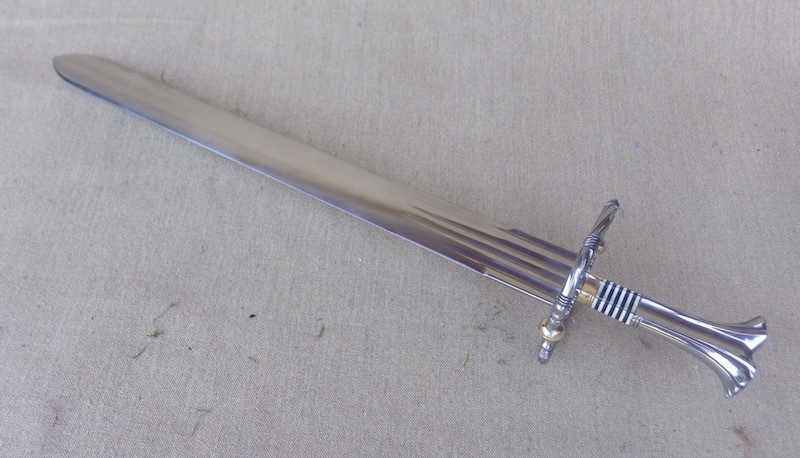 It is a short sword great for close up fights and for looking cool. Pretty much every picture of Landsknechts will have at least one soldier strutting his stuff wearing one of these. Apparently the name 'Katzbalger' means cat fight and so these short swords are well suited to close up melee type fights and perfect for an ale house brawl. 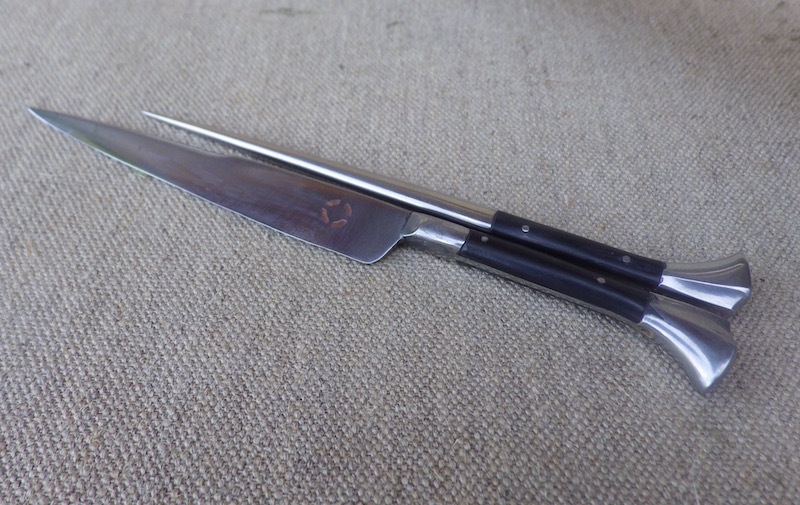 The blade is in spring steel with a two short and two slightly longer fullers each side and a ricasso. At the ricasso the blade is 6mm thick and tapers down steadily from there. The blade itself is lenticular in section and has been left quite stiff, so although short, it strikes with intent. The guard has been formed and filed as long straight sections which are then bent around into a 'S' shape and terminated with brass finials and a brass addition to the quillon block. The organic grip section is made from stacks of bone and horn and the grip is finished in dramatic fish tail in steel. The use of a few different materials in the grip is quite normal as is the long pommel and short 'grip' and I love the striking appearance of the bone and horn. 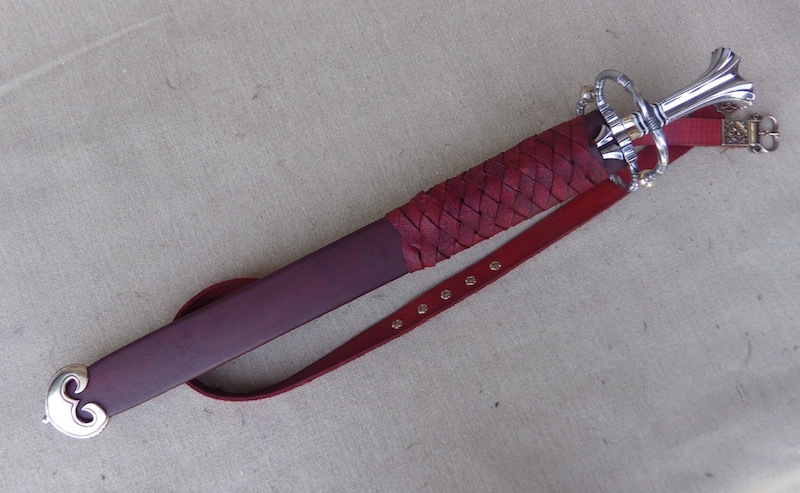 The scabbard is made from poplar and covered with veg tan leather with a pocket for an eating set. The scabbard itself is nearly as iconic as the sword and is worn near horizontally with the belt threaded through a woven leather binding and the whole is finished with a bronze chape. The Germans/Swiss seemed to particularly love having eating sets on their swords and this comes with one too. 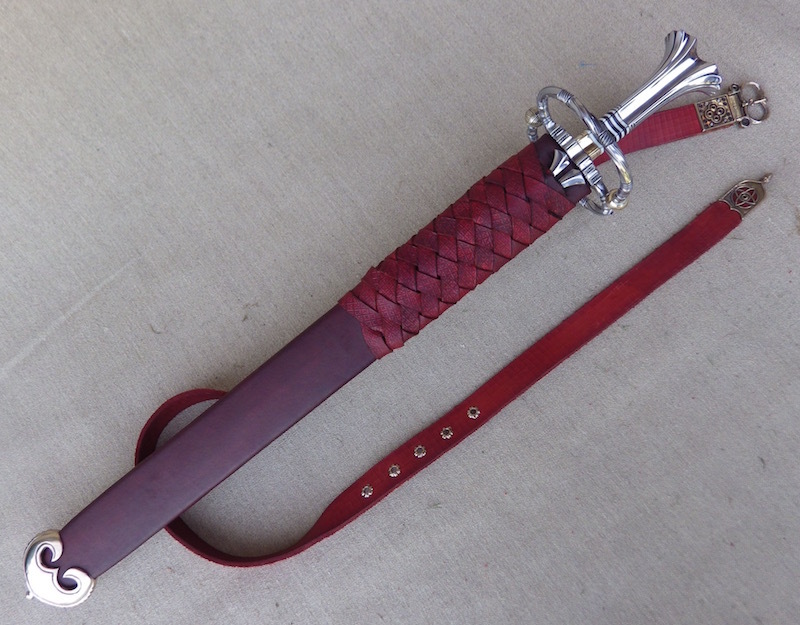 The pommels are made to emulate the fishtail of the sword and have steel furniture and horn grips. I hope you like it and any comments or thoughts are very welcome. Stats will follow in the next day or two. As the Landsknechts no doubt used to say, Bitchin. Absolutely bitchin. The Bright red scabbard really takes it to the top. Just a great contrast. 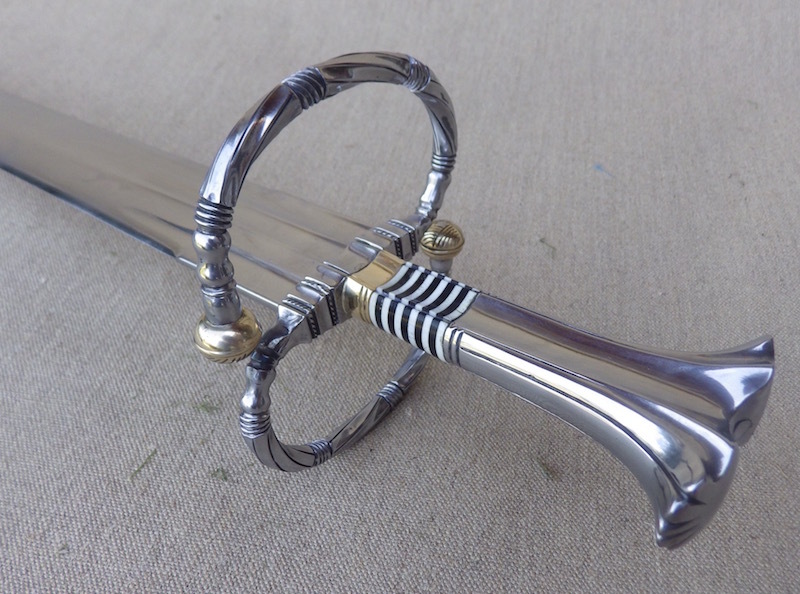 Love how the eating set pommels echo the fishtail pommel, that's such a great idea. Awesome filing on the quillons. The belt buckle and tab look really nice. Every element is just expertly done and chosen! I second the bitchin' statement. Tasteful, bold, flamboyant and detailed, it's just the sort of thing a stylish landsknecht would wear about the town or the battlefield. I love the lenticular cross section; I think I've seen mostly lenticular blades in museum photos or woodcuts, but mostly flattened diamond sections on repos. Love the grip and the byknife and the whole lot. Another stellar piece out of your shop, Tod. I was sent photos of this a couple days ago by the new owner and the piece floors me. I'm happy for him, of course, but also really super envious. Great work. Tod, very attractive design, the file work is fantastic. The contrast in colours and textures really work well with the flow of the very sculptural pommel. Your work always impressive seems to get better all the time. Beautiful piece Tod. What are the dimensions? 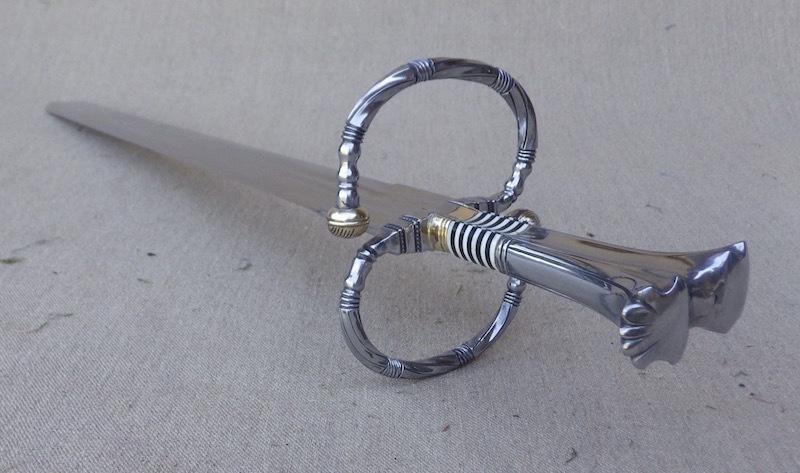 Very nice work, as always and I like the idea of repeating the pommel shape on the set of by-knives! Could you post a shot of the back of the scabbard, please? This is wonderful, very clean. Katzbalger my favorite, I often watch in the museum. Thank you for showing Tod. Thanks so much for all your kind words and it is interesting to see how taken people are with the eating set. I will try and get some stats to gather. The addition of the eating set is one of those details that makes the piece for a lot of us. 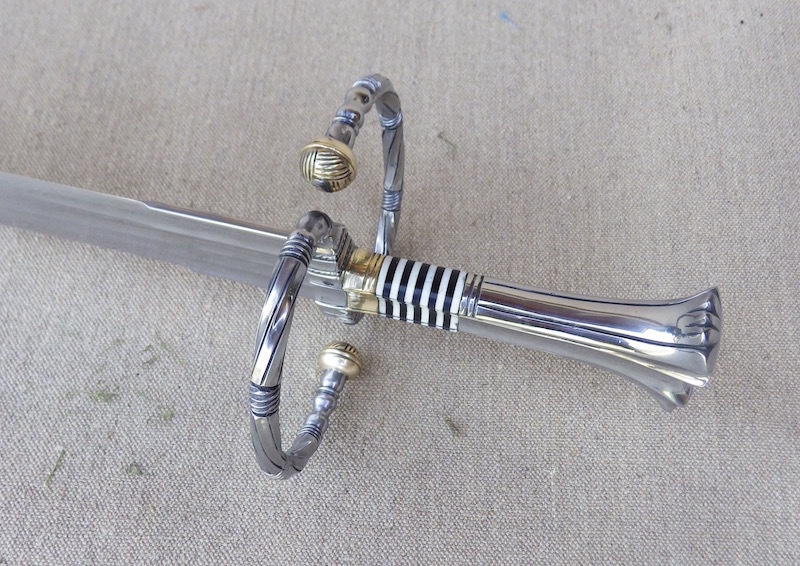 The sword itself is outstanding, but an added detail like that takes it to another level. Trey bitchin'. I have to agree with Patrick about the reason the eating set is drawing so much attention. 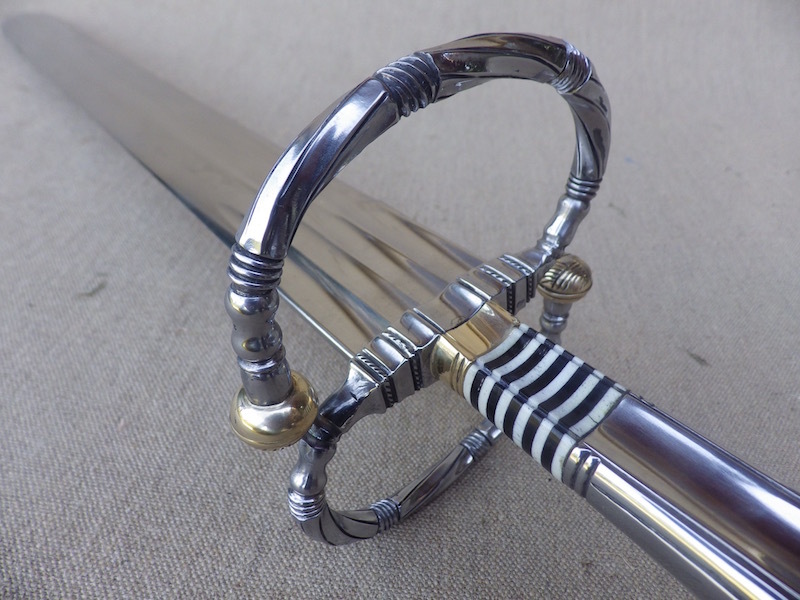 It compliments what is already a work of art in the form of the sword and scabbard and brings it to the next level. The grip really grabs my attention. THe guard, just blows me away. Truly envious of whomever the lucky owner of this is. I think you have just set a new standard for German mercenary bling. Now if you will excuse me, I will just be over here crying quietly. Thank you once again - very kind. I'm late to this party. My god, Tod, this one goes to 11. The utensils. The scabbard. Just gobsmacking wow. Your customer must be ecstatic.